Keep your home comfortable and cash in on energy savings with the RTH7500D 7-Day Programmable Thermostat from Honeywell. 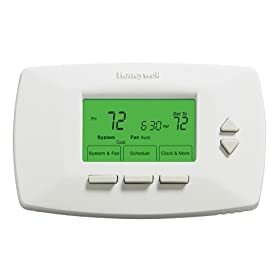 Designed for quick installation and offering simple push-button controls and an easy-to-read screen, this thermostat lets you control the temperature of your home without having to make constant manual adjustments. You know that turning down your heat at night saves you money, but you hate waking up and making breakfast in a freezing cold kitchen. Or you don't want to run your AC all day while you're at work, but you want your home to be cool and comfortable when you get home. That's where a programmable thermostat makes all the difference. Precise temperature control of +/-1-degreesF with auto change from heat to cool.